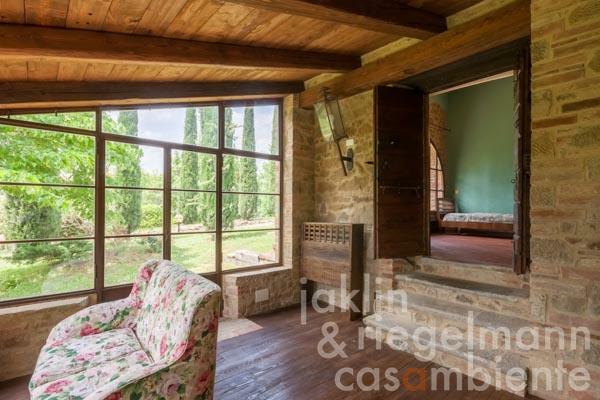 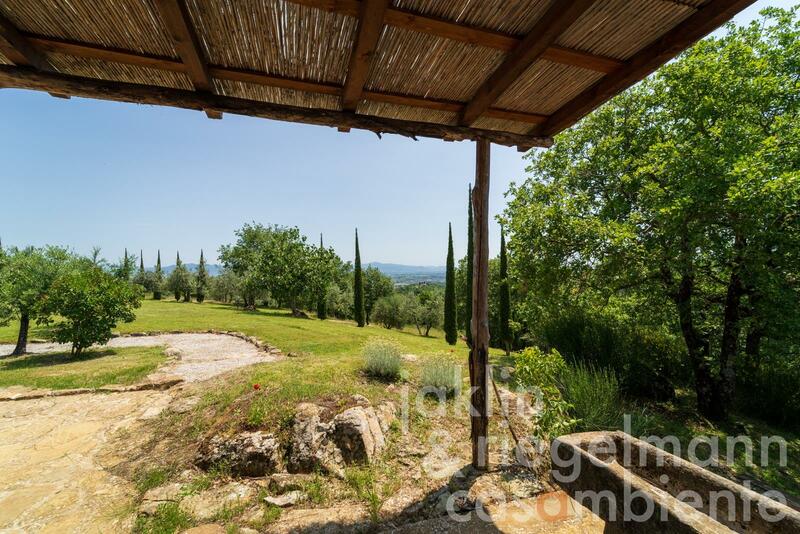 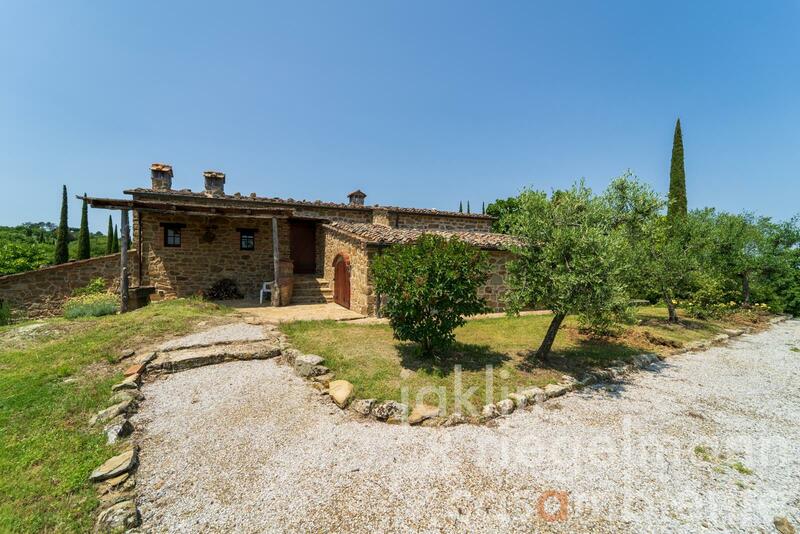 The property is surrounded by lawns, olive groves and forest. 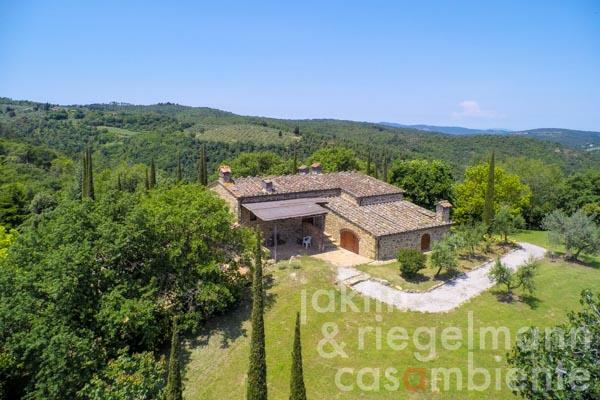 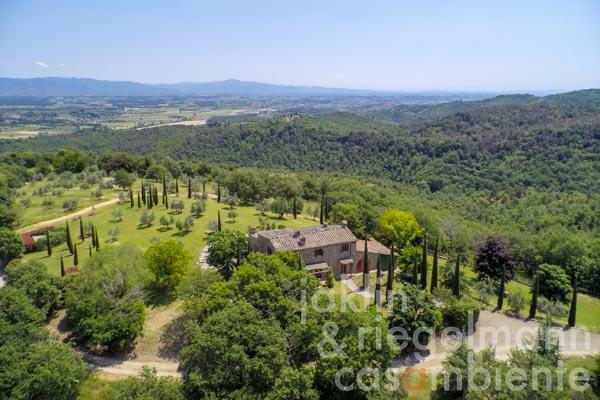 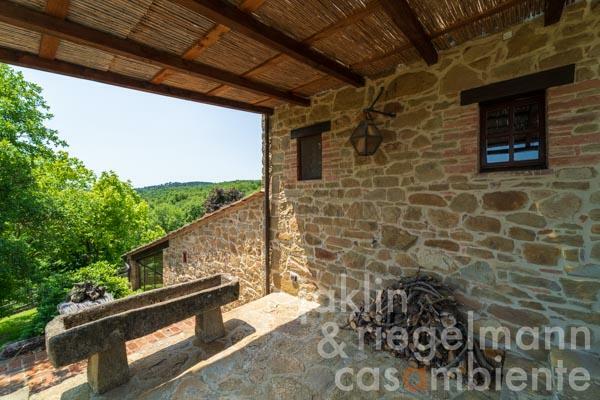 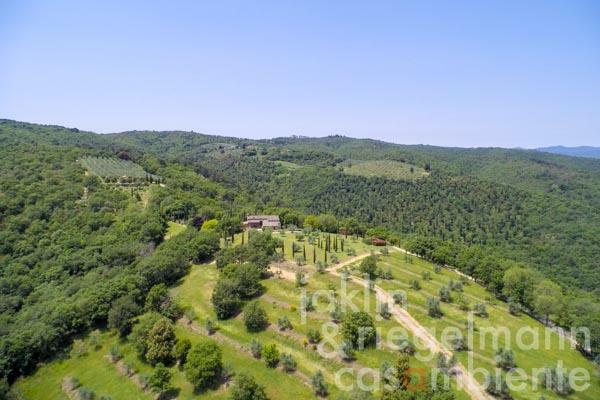 The entire area is architecturally protected, the landscape is very scenic and offers good accessibility to the two provincial capitals Arezzo and Siena. 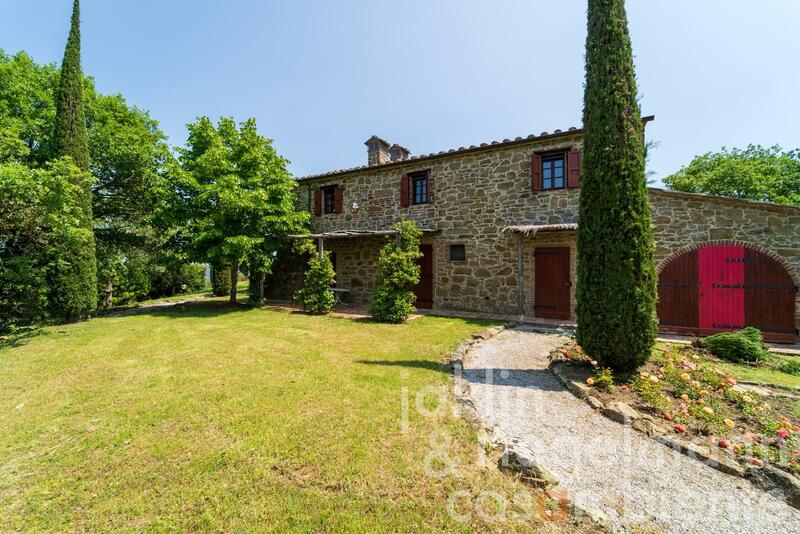 For sale is this completely independent stone house with the advantage of the right to use a nearby pool and tennis court. The house has a living area of approx. 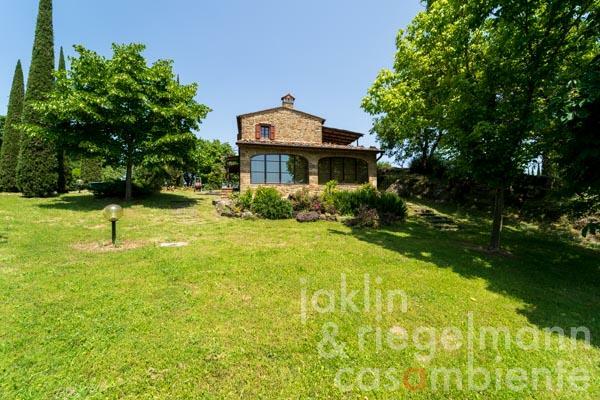 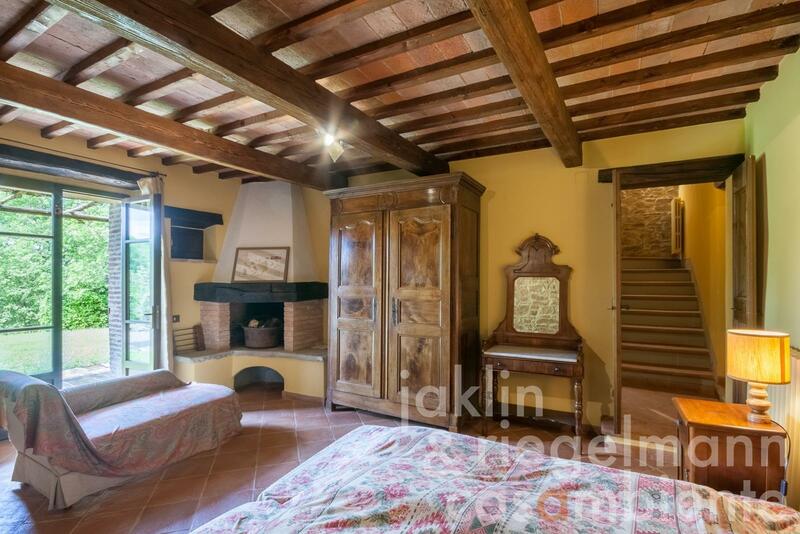 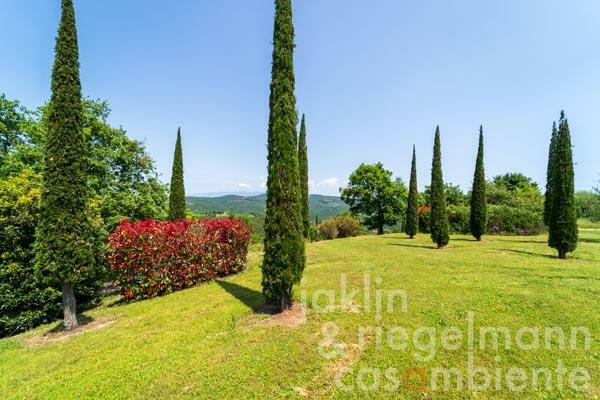 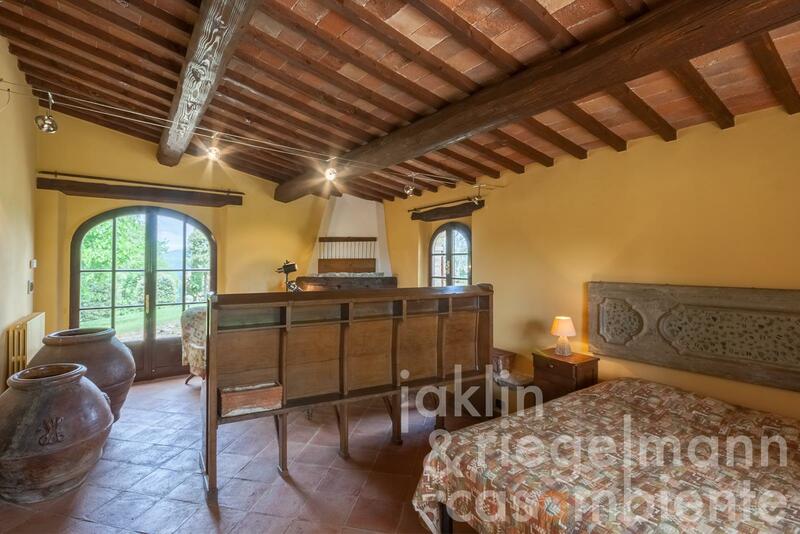 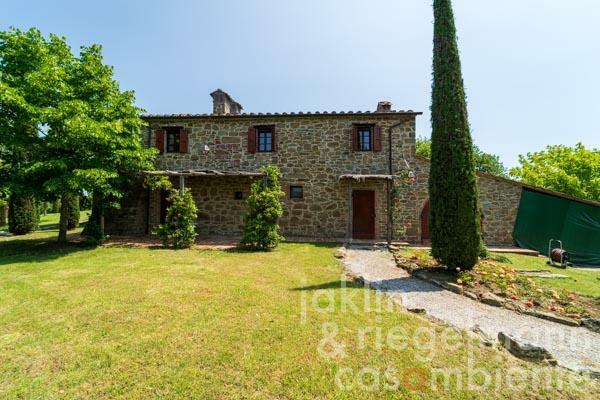 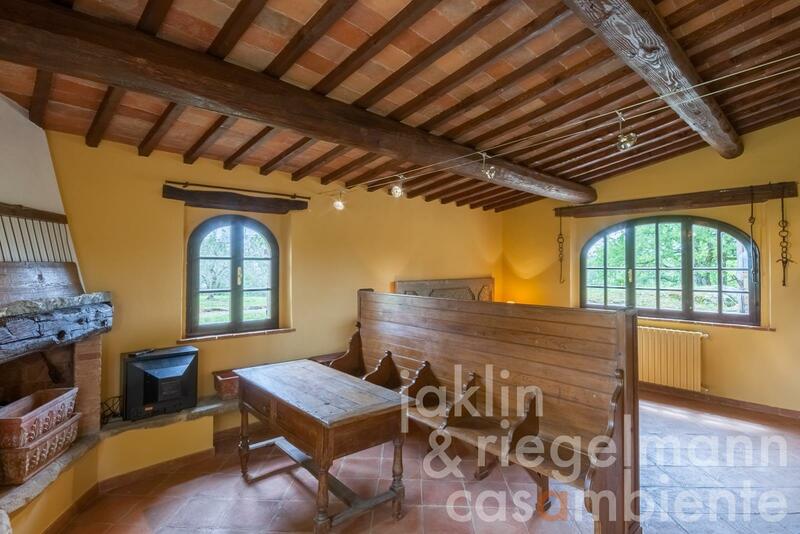 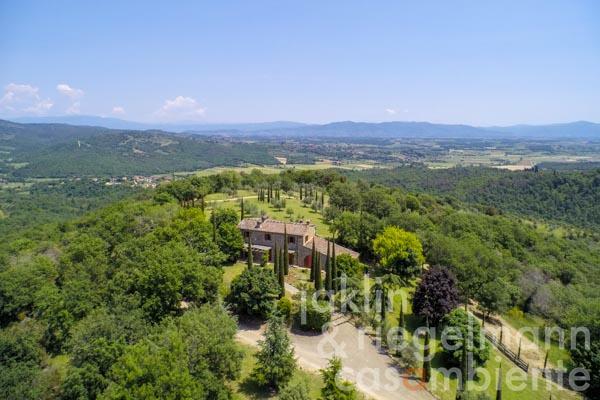 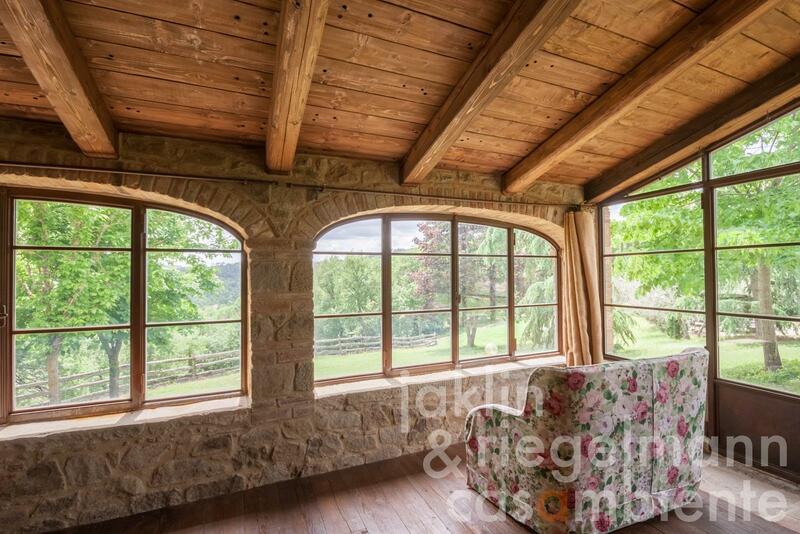 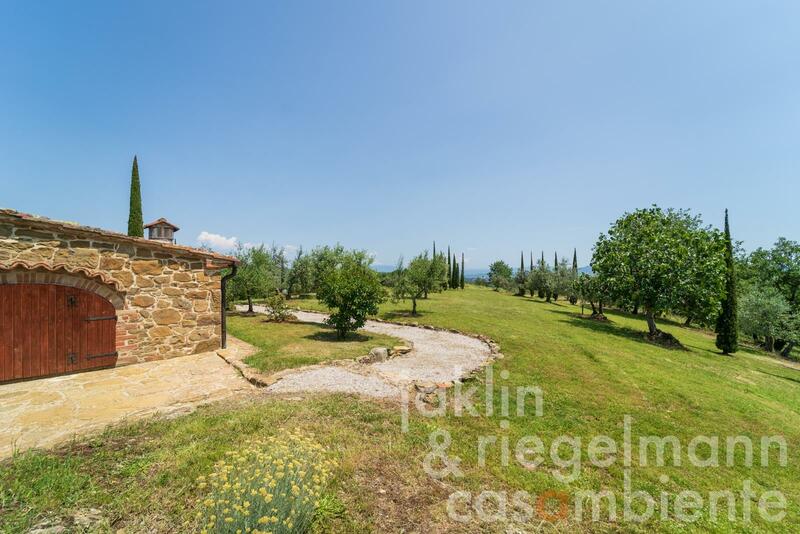 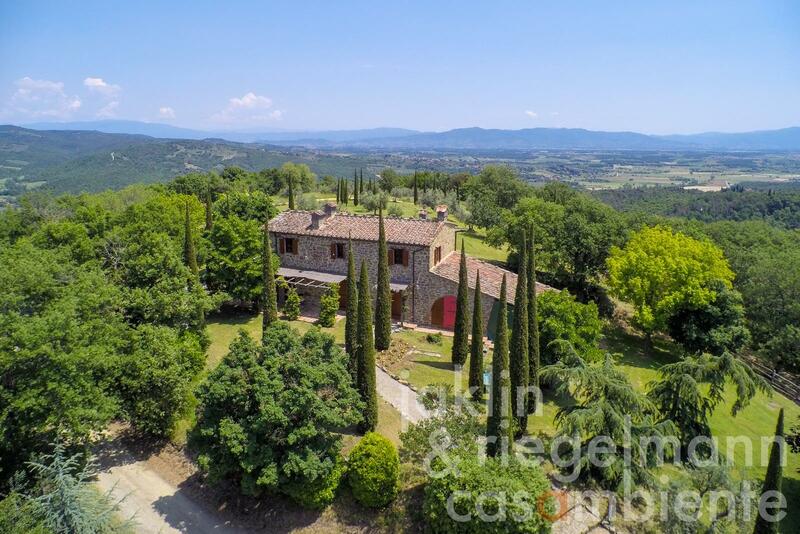 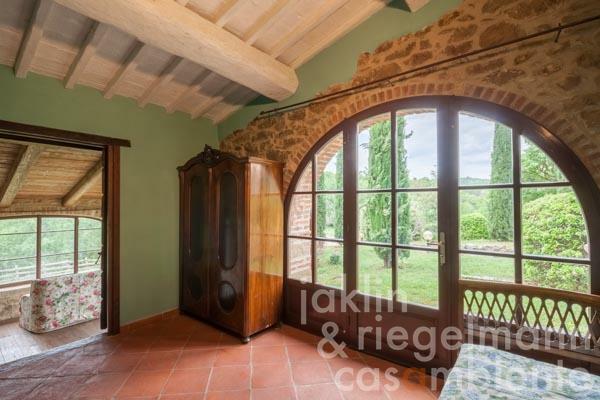 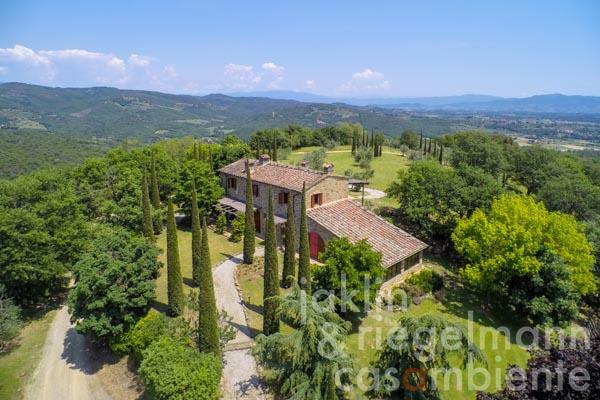 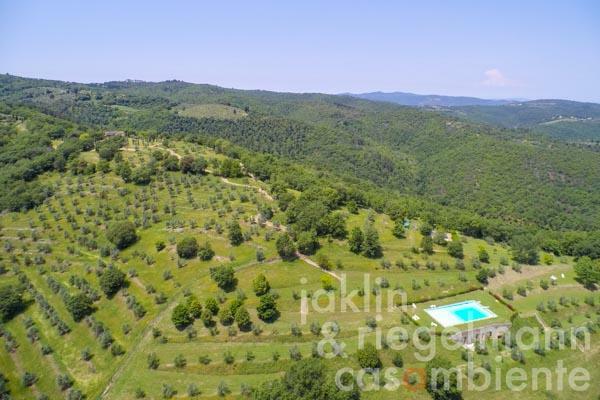 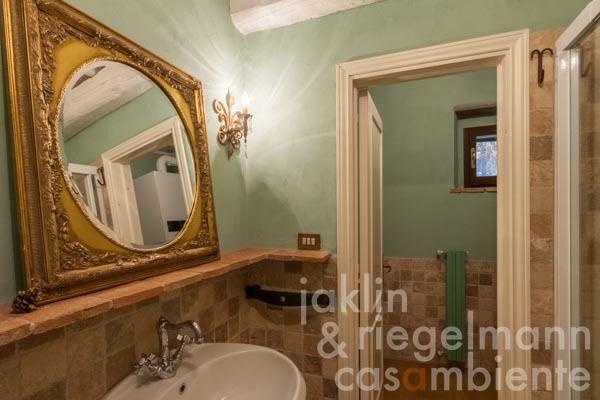 300 m and is situated in a very beautiful panoramic position a bit distant from the Borgo in complete peace. 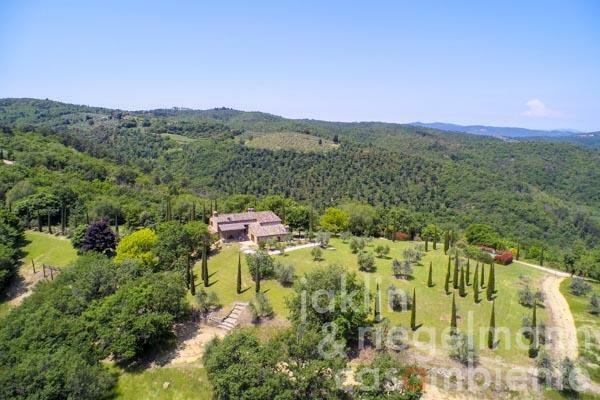 From here you have a 360° view over the valley and the surrounding forests. 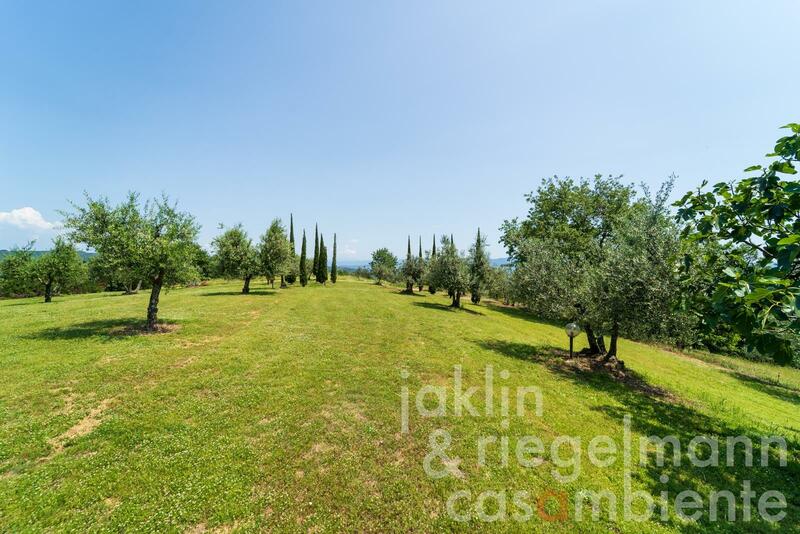 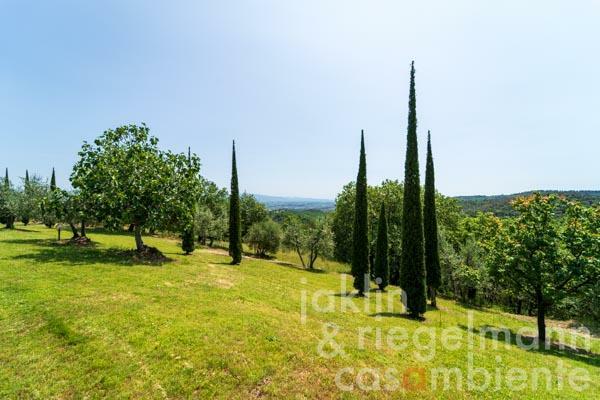 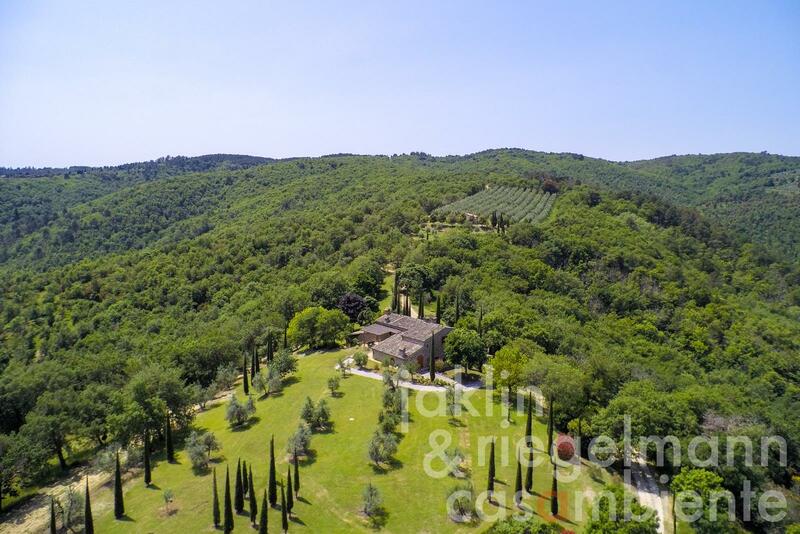 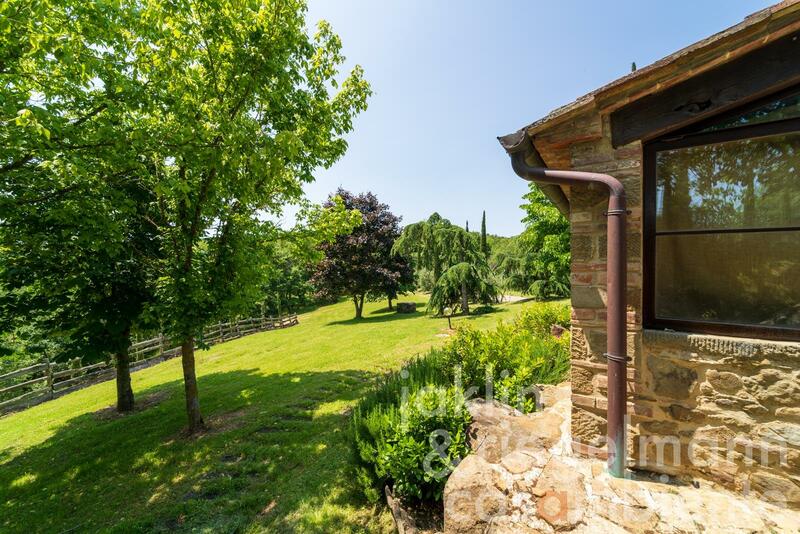 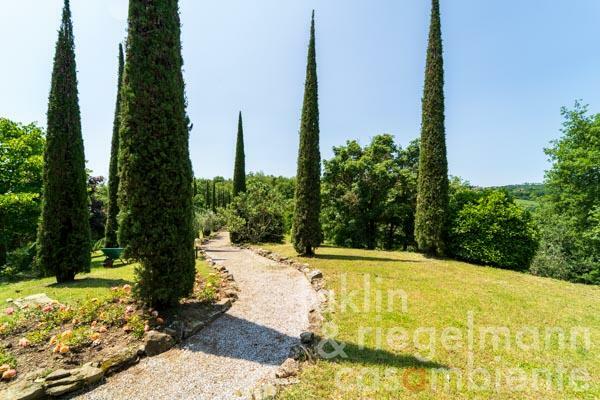 The property has a private garden of about 1.000 m and is surrounded by an olive grove, evergreen oaks, oaks, pines and about thirty cypresses about 50 years old. An adjoining forest was rented privately by the current owner to ensure further autonomy. On the ground floor of the two-storey house there are an entrance hall, a living-dining room with fireplace, three bedrooms, one with fireplace, two bathrooms with shower or bathtub, a storage room and a sun-drenched studio with Jacuzzi and a beautiful view. 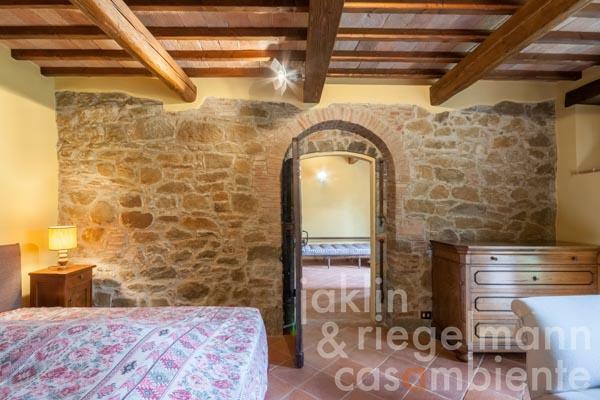 The upper floor, which is accessible via two internal stairs, is divided into a studio/bedroom, a living and dining room with fireplace, a kitchen and a bathroom with shower. There are two wells on the property, one of which supplies the house and the other is used for watering the garden. In addition, rainwater is collected into a cistern for garden irrigation. 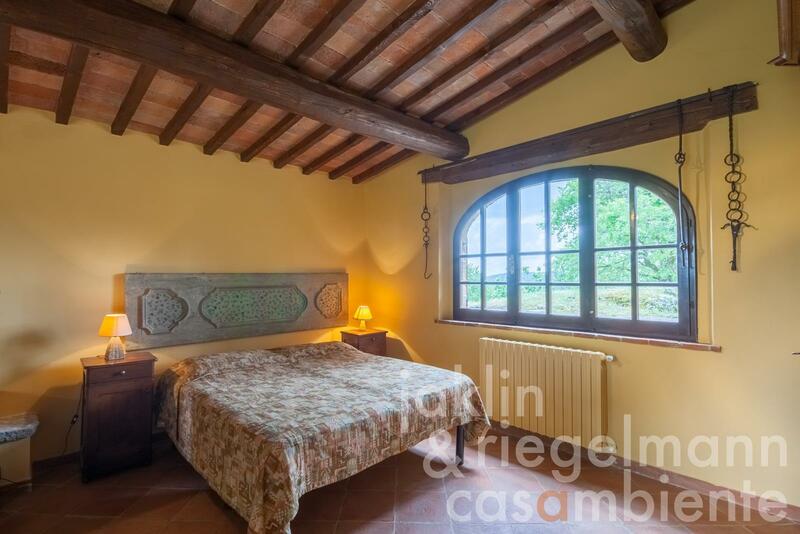 The property was completely renovated in the mid-1990s and in the last 10 years further improvements have been carried out such as the design of the studio, so that today it is in very pleasant condition. The nearby village with all shopping facilities, restaurants, banks, etc. 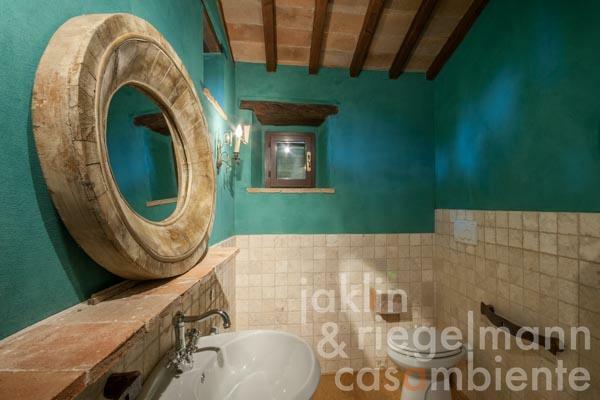 can be reached in 10 minutes. 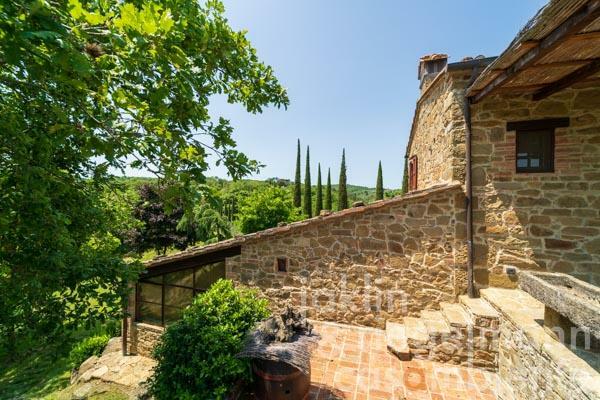 Arezzo, Cortona, Siena and the Val d'Orcia are about 30 minutes away and Florence and Perugia can be reached in 1 hour. 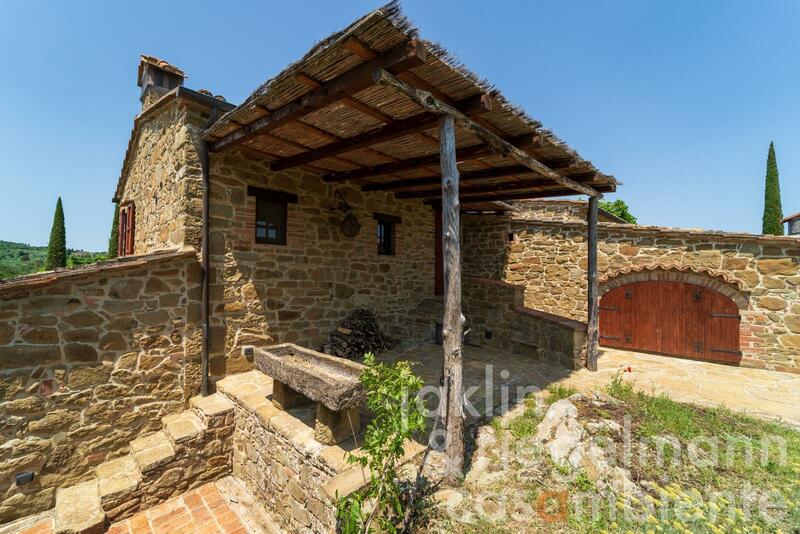 Italy, region Tuscany, province Arezzo, municipality Civitella in Val di Chiana. 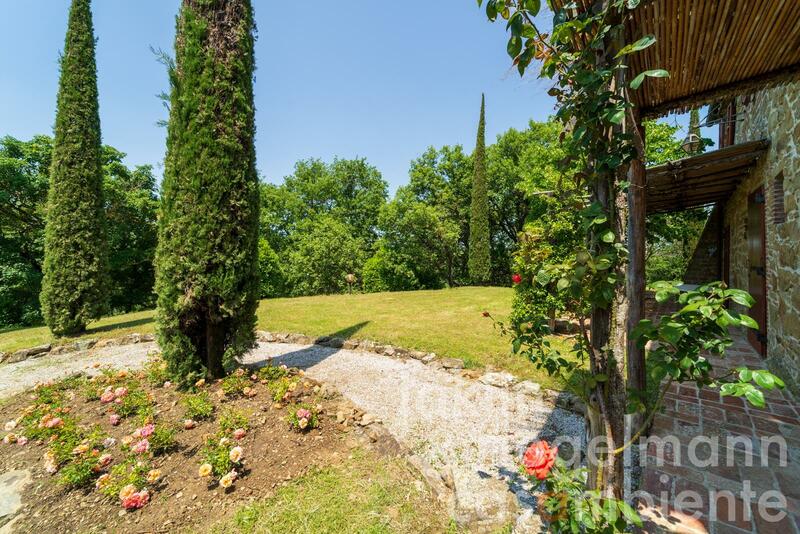 1,000 m² private garden and approx. 18 ha common property. 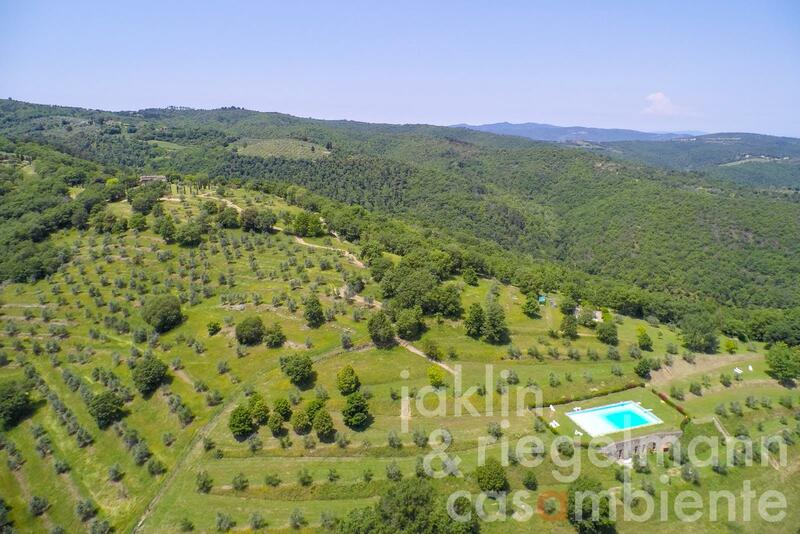 Electricity, own well water, rain water cistern, central heating, fireplace, gas tank, broadband internet access, satellite-TV, automatic gate, irrigation system, swimming pool, private parking, terrace, olive grove, garden.